Back to school is one of my favorite times of the year! With all of the excitement of meeting new students, teaching routines and procedures, and starting a brand new school year comes complete (yet exciting) exhaustion. So back to school not only means a lot of fun, but also includes a lot of coffee! 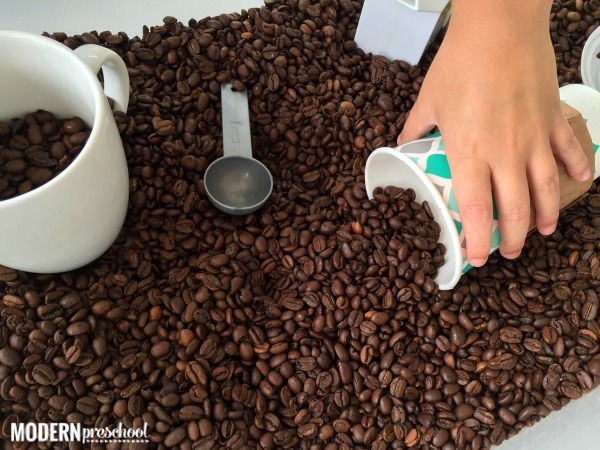 To end my first week back with my preschoolers, I put together a coffee bean sensory bin. Maybe just the amazing scent of the coffee beans in the classroom will keep me going while my preschoolers are introduced to their first experience of sensory play in our classroom! The great thing about this sensory bin is that you can set up this sensory bin with what you have on hand! At the grocery store I purchased 2 bags of whole bean coffee. These bags are not as easy to find as I thought they would be. I ended up squeezing a lot of coffee before coming across bags of coffee beans. In the bottom of our favorite plastic bin, I dumped the coffee beans. I added real coffee mugs, travel cups, measuring spoons, our pretend pourable milk, and coffee stirrers to the coffee beans. 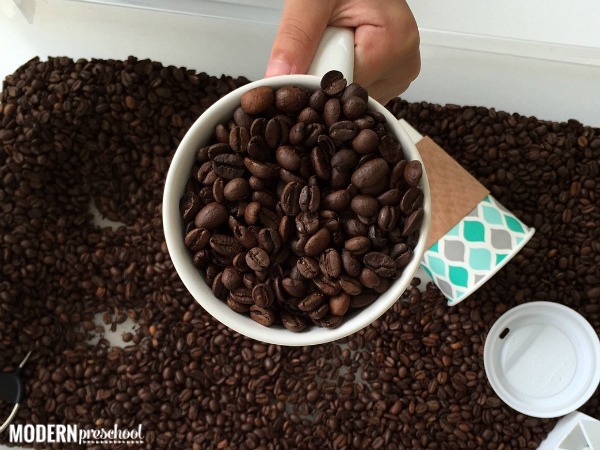 Before even bringing the coffee bean sensory bin into my classroom, my own kids at home tried it out. As soon as they walked in from the bus stop, they thought I had just made coffee. Nope! But when they realized there were coffee beans to play in, their hands were immediately in them. 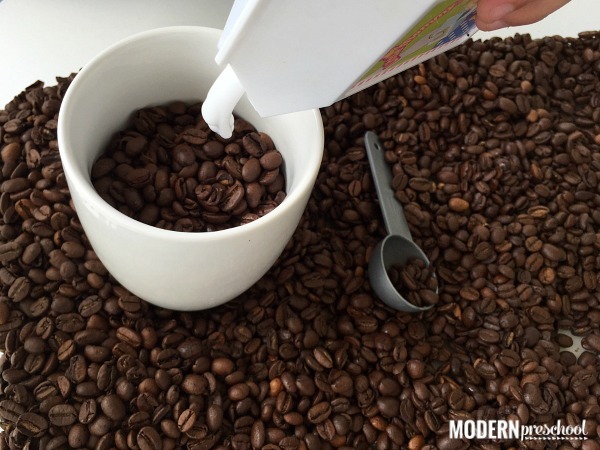 Soon they were pouring, scooping, filling, dumping, and overflowing coffee beans. The feel of the coffee beans were similar to the split peas we used last fall as you ran your hands through them. The only thing about the split peas was that they didn’t have the amazing coffee smell to them. 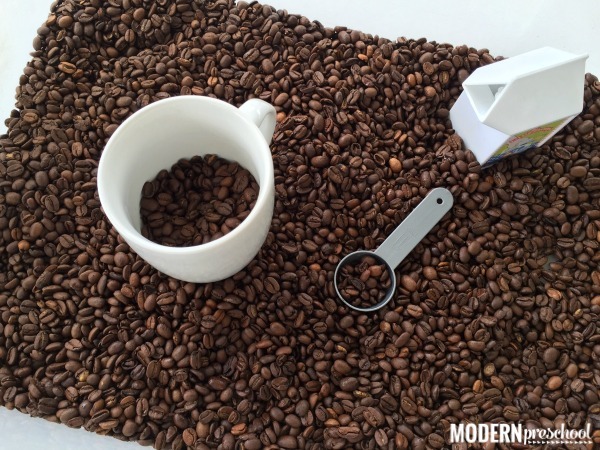 This is the bonus sensory experience that comes with playing in coffee beans. I’m all about keeping things simple in my classroom. As I introduce our first sensory bin to my 3 year-olds, not overdoing the accessories inside the bin is important. 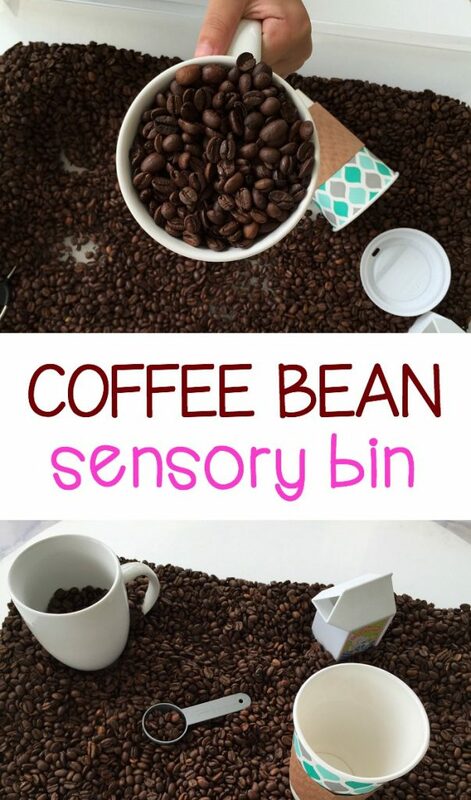 This way my preschoolers can easily play in the coffee bean sensory bin without needing a lot of instruction besides, “Let’s keep the coffee beans inside the bin.” The exploration and pretend play during our morning is all up to them! Who needs a cup of coffee? I know I do!